Many of the melodies in this book are more than nine hundred years old; yet these pieces are as vibrant, as exciting, and as seductive as they were centuries ago.This music is fun to play. It’s addictive. You will find yourself humming it, and you’ll come back to play these pieces again and again. Each piece in this collection has its own powerful personality. 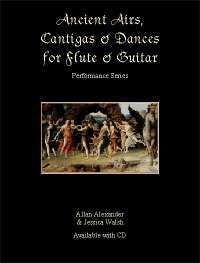 Many of the Cantigas have an indefinable feel we have not heard in music from other periods... It’s like a texture that fills the room, it permeates the air and once inhaled, it paints pictures in your mind. You hear it and you feel it down to your toes. This is music that follows you and begs to be played again and again. If you are an intermediate player, you will find that most of these high-quality pieces are readily accessible. If you are a professional, you will find this book to be a resource that you will draw on repeatedly. If you just like to play for yourselves, it will be a great source of entertainment. For us, this collection is all of the above. These pieces work for concerts, for weddings, and for restaurants. This is some of our favorite music, and we hope that you have as much fun playing it as we do. Included with this book is a digitally mastered audio CD of the music.